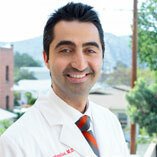 Dr. Harutunian is a board-certified neurologist and clinical neurophysiologist who specializes in the diagnosis, management, and treatment of a variety of neurological disorders, which include but are not limited to stroke, memory loss, seizures, nerve and muscle disorders, dementia, multiple sclerosis, headache disorders, sleep disorders, pain syndromes, traumatic brain injury, and various neoplasms. Dr. Harutunian obtained his medical degree from the Chicago Medical School. He completed internship in Internal Medicine at the UCSF Medical Center, residency in Neurology at the USC/Los Angeles County Medical Center and fellowship in Clinical Neurophysiology at the Keck Hospital of USC. Dr. Harutunian is fellowship trained in electrodiagnostic medicine, which includes electromyography/nerve conduction studies (EMG/NCS) for the diagnosis of peripheral nervous system disorders and electroencephalography (EEG) for the diagnosis of epilepsy and other central nervous system disorders. Dr. Harutunian has presented his research at multiple American Academy of Neurology conferences. He is a patient advocate who provides quality evidence-based care and is dedicated to extending his academic knowledge to his community.